The Chinese saying ( 生, 老, 病, 死 = you are born, get old, get sick and die) that I quoted in my last post may be realistic, but it is not exactly an uplifting calling for life and it is no wonder that you look for an escape from its strictures. One option that almost every religion offers is the possibility of an afterlife, cleverly tied to how closely you follow that religon's edicts. For corporations approaching the end stages of their life cycle, this option is a non-starter, since there is no corporate heaven (unless you count starring in a Harvard case study or in a TV show as heavenly) or hell (though bankruptcy court comes awfully close). The other option is the possibility of a rebirth or reincarnation, in a different life, if you are Shirley Maclaine, or in the same life, if you manage to redefine yourself. After all, we are uplifted by stories of people who having experienced that rebirth; athletes who transition to successful business people (Magic Johnson) or actors who become presidents (Ronald Reagan). On this count, corporations have an advantage over individuals since they are legal entities that can reinvent themselves, while holding on to their corporate identities. Looking back at history, there are companies that have beaten the odds of the business life cycle, fought off decline, and been reborn as successful ventures. Two examples that were noted in the comments section of the last post come to mind: IBM’s fall from glory in the 1980s and its subsequent rebirth as a vibrant corporation and Apple’s climb back from the dark days of 1997 to the top of the market capitalization table in 2012. As we think of these and other examples (and they are the favorites for obvious reasons for case study writers), it is worth noting that the very fact that we can name these companies suggests that they are the exceptions rather than the rule. Notwithstanding that sobering reality, it is still useful to put these success stories under the microscope, not only to get an understanding of what allowed these companies to succeed, but also to develop forward-looking criteria that we may be able to use in investing. Acceptance that the old ways don’t work any more: To have a corporate rebirth, a company still has to get through the three step reaction to corporate aging that I noted in my last post and come to an acceptance that the old ways, successful though they might have been in the past, don’t work any more. That acceptance, as I noted, does not come easily or quickly and the longer and more hoary the history of the company, the longer it takes. Thus, while there are many younger investors whose experience with IBM has generally been positive, I remember the late 1980s when a series of CEOs at the company raised denial to an art form and almost pushed the company into irrelevance. Acceptance also requires more than lip service to change and has to be backed up by actions that indicate that the company is indeed willing to jettison big portions of its past. A Change Agent: This may be a cliché but change has to start at the top. In fact, change at IBM really began when Lou Gerstner became CEO of the company in 1993. At Apple, the change agent was obviously Steve Jobs, a man who had been banished from Apple for his lack of focus a decade prior, but returned as CEO in 1997. It would be simplistic to say that the change agent always has to come from outside the company, because there have been companies where insiders who have spent a lifetime in the company have been willing to shake it up. (Bob Goiuzeta at Coca Cola and Jack Welch at GE were company men who still revolutionized their companies.) I think it is safe to say, though, that change agents are usually not shrinking violets and that they are ready to shake up the status quo. A Plan for Change: Pointing out that the existing ways don’t work any more is important but it is futile unless accompanied by a new mission and focus. At IBM, Gerstner changed the mindset of the company (and its employees) early in his tenure, an incredible accomplishment given how deeply entrenched it was in the existing ways. Coming from RJR Nabisco, he brought both a customer-focus and a willingness to let go of IBM’s past mistakes (Anyone remember OS/2?) and this allowed him to create the modern IBM. Steve Jobs shocked Apple employees by entering into a détente with Microsoft, where in return for $150 million in cash and a promise by Microsoft that it would continue producing Office for the Mac, he essentially gave Microsoft a free legal pass to borrow from the Mac OS in updating Windows. He used the breathing room that this agreement gave him to redefine Apple as an entertainment rather than a computer company and the rest as they say is history. Luck: Much as we would like to attribute success to great skill and failure to poor management, it remains true that the X factor in business success is luck. Gerstner was lucky that he made his changes at IBM in the 1990s, a decade of not only robust overall economic growth but especially so for technology companies. Steve Jobs was helped by the ineptitude of his competition, so blinded by their investment in the status quo (music companies to selling us music on CDs and cell phone companies thinking of cell phones as extensions of landline phones) that they either did not react or reacted too slowly to Apple's innovations. I am sure that this is not a comprehensive list and that I have missed a few items but I want the list to be tractable because I intend to use it in my investment analysis. Companies that have been value traps can become great investments, if they can find a path to rebirth; an investor who bought IBM shares in 1993 or Apple shares in 1997 would have profited immensely from their reincarnations. 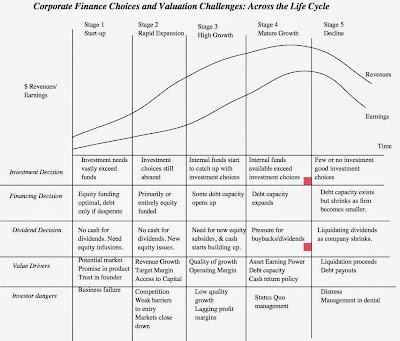 So, as an investment exercise, you could prepare a list of the companies where stock prices have stagnated for long periods and check to see which of them have the ingredients in place for rebirth: an acceptance that the old ways don’t work (with tangible evidence in investment, financing and dividend decisions to back it up) and a change agent (new management), a new focus (with actions to back it up). The last factor, luck, is immune from assessment but you can consult your astrological signs or read the tea leaves, if it helps to make the right choices. Putting this approach to use on Microsoft, Cisco and Merck, let's look at whether these companies have the ingredients for rebirth (and thus not be the value traps that I made them out to be). In the table below, I have listed the three ingredients (leaving out luck) and how each of the companies measures up on each ingredient. Not sure. The company still believes that it can produce hardware (smart phones, tablets), using the same strategy that worked for it on software (overload the product with features and overwhelm the opposition). This is a company that had incredible success in the 1990s with its strategy of buying small technology companies and converting them into commercial successes. That strategy failed over most of the last decade. The company seems to be suggesting that it will scale back in the future, but while it has announced layoffs, its acquisition pace has not slackened. Merck has been a mature pharmaceutical company for two decades but its R&D policies suggest that it sees itself differently. While there are noises coming from the company that are good (increased buyback, accountability in R&D), the company has been slow to adapt. Steve Ballmer is leaving and a new CEO is coming in. That is the good news. The bad news is that this new CEO is being picked by the same board of directors at Microsoft that seems convinced that nothing is wrong with the company. The CEO who built this company up in the late 1990s was John Chambers. The CEO who made bad acquisitions during the last decade was also John Chambers. The CEO of the company that claims to have seen the error of its ways is once again John Chambers. Unless he has multiple personalities, I don't see how he can pull this off. Who is Merck’s CEO? This may just be ignorance on my part but I had to look it up: it is Ken Frazier, who has worked at Merck since 1992. I compliment the gentleman for keeping a low profile but change agents are not sell-effacing characters. None that I can see (yet). The acquisition of Nokia suggests that Microsoft is going to keep trying to go after the smartphone business. Even if it succeeds, that strikes me as more opportunistic and 'me too" than visionary. The company has told us it will not go for growth for the sake of growth, but it continues to do large acquisitions. The evidence suggests that Merck is slowly coming to an acceptance that its historic model is running out of steam (stock buyback, talk about cutting R&D) but there is little sense of what is going to replace the existing model. Change in CEO provides hope, at least for the moment. Actions speak louder than words. If Cisco can go a year without major acquisition & a new focus emerges, chances improve. Looks like the best case scenario is that it is heading to the equivalent of corporate “senior” living. 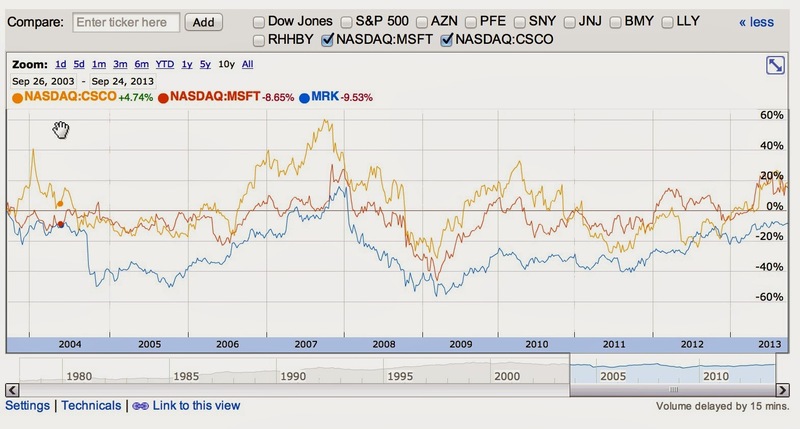 Of the three companies, I would argue that Microsoft offers the most in terms of possibilities simply because it is getting a new CEO, Cisco is talking the talk (of changing) but is not walking the walk and Merck seems to be stuck in a rut. You are welcome to disagree with me on my conclusions but even if you do, there is no reason why you cannot use the framework to make your own judgments. Speaking of Apple, I am sure that there are many frustrated stockholders who are wondering whether the company is ready for another rebirth. Much as I like the company as an investment (and I value it at $600), I don't see the ingredients in place yet. While the company has capitulated on the financial front (agreeing to borrow money & buy back more stock) it still seems to be caught in the smartphone rat race with no end in sight. Tim Cook has shown his operating acumen but he does not strike me as a change agent and I am still unsure about his vision for the company. Maybe that will all change in the next few months, but I am not holding my breath! The last few days have been filled with reminders for me of both the destructive and the redemptive powers of life. The weekend started with a family outing to a Yankee game. As a fan, it was wrenching to see Mariano Rivera and Andy Petite, two players who I have watched for almost two decades, pitch for the final time in Yankee stadium, but it was redeemed at least partially by a young Yankee pitcher, Ivan Nova, pitching a complete game on Saturday. Yesterday was my birthday, a joyous day marred only by the realization that putting as many candles on the cake as my age merited would likely set off fire alarms. Before I could feel sorry for myself, though, my eighteen-year old daughter, a freshman in college, called, exhilarated about getting a hundred on her first college exam. Towards the end of the day, the story that Blackberry had an offer to be taken private by Fairfax Financial for $4.7 billion crossed the newswires, an occasion for mourning not just by longtime Blackberry users but for anyone who appreciates life changing technologies, but that story was accompanied by one from Apple, announcing that the company had sold nine million iPhones over the weekend. 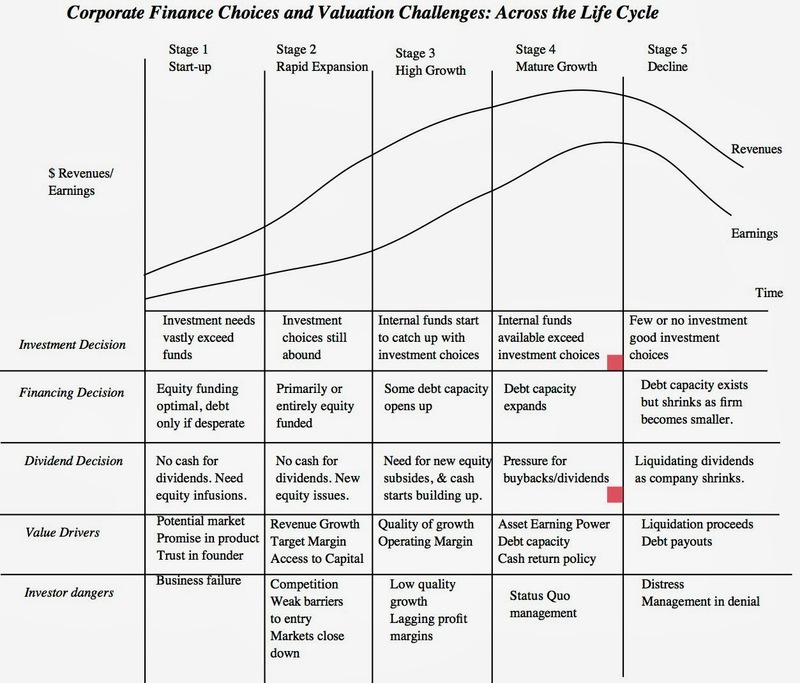 The business life cycle also shapes how we approach valuation, with the principles not changing, but the focus shifting at each stage of the cycle. When valuing young, growth companies, the drivers of value are almost invariably in the investment choices that the company makes and the effects of those choices on both growth and profitability. Thus, with Tesla and Facebook, it is the revenue growth and target operating margins that determine value and not how much debt they have in their capital structure or how much they pay in dividends. When valuing mature companies, the focus in valuation changes to valuing existing assets (and their earning power) and to the effects on value of better financing and dividend choices. Thus, for Apple, as much of the discussion of value is focused on whether the company will gain from its use of debt and buying back stock as it is on the future growth of the company. When valuing declining companies, the focus is on winding down portions of existing businesses, while repaying debt due and returning as much cash as possible, in a timely fashion, to stockholders. In my December 2011 post on Blackberry, I estimated a value of about $ 9 billion for the company, on the assumption that the best course for the firm was to narrow its focus to a niche product (I called it the Blackberry Boring, a phone for security-conscious corporates that would prevent games, apps or other distractions from getting in the way of employees checking their email) and liquidate itself over time (five years) in an orderly fashion. 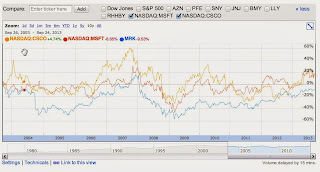 I followed up by looking at Blackberry (RIM) and Nokia as potential contrarian plays in June 2012, but luckily, I went with Nokia as my pick. That option play paid off partially because Nokia recovered from its lows but the big payoff came, ironically, when Microsoft bought them early this month. If aging is part of being human, it is just as human to fight aging and businesses seem to follow the same script. Rather than accept maturation and decline as inevitable parts of the business life cycle, businesses seem to go through their version of the stages of grief, starting with anger (at markets), denial (about being mature or in decline) and final acceptance. 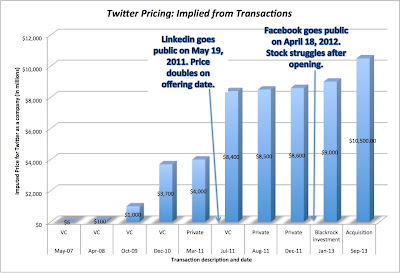 When growth companies transition to becoming mature companies, the market responds by lowering the multiples that they are willing to pay for earnings and some investors demand that the company behave like a mature company, borrowing more and returning more cash to its stockholders (in dividends and buybacks). In many of these companies, managers respond first by accusing markets (and by extension, their own investors) of being short term and ignorant of the facts. While that characterization may fit some (or even many) investors, it still remains true that markets are often more perceptive than managers are. The emotional connection: In the midst of the Second World War, when it was clear that Britain could no longer hold on to its far flung colonies, Winston Churchill was quoted as saying that "I have not become the King's First Minister in order to preside over the liquidation of the British Empire." Many managers at iconic companies that have fallen into decline tend to go along with this sentiment, especially if (like Churchill) they were involved in building up the companies in the first place. That explains why a Michael Dell would leave a comfortable retirement in 2007 to return to his namesake company as CEO, in a futile attempt to turn the company around. Fountain of youth ecosystem: Just as there is a lucrative ecosystem that makes money of the desire to stay young (cosmetic surgery, magic supplements, hair transplants etc. ), there is an even more lucrative ecosystem of bankers, consultants and turnaround experts who promise mature and declining companies that they will lead them back to everlasting growth. They play to management egos and offer them hope, while eating through billions of dollars of stockholder money, with little to show for it. 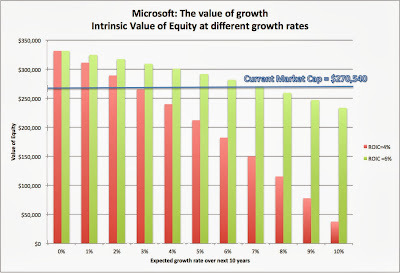 Analyst Growth Obsession: Many equity research analysts are obsessed with earnings growth, judging companies on how much they grow rather than on how much value that growth adds. Thus, a declining company that invests badly to grow at a low rate is viewed as better than a declining company that shrinks, while paying out large dividends. Not surprisingly, managers feel the need to feed this obsession for growth. The PR problem: If your business is declining and your growth prospects don't look good, the right thing for you to do as a top management is to accept that reality, convey it to your employees and start shrinking the business. However, that is not painless and people will lose jobs, employees will see their paychecks shrink and customers will lose their favorite products. If you are in the public eye, you (as the CEO) will be labeled a Scrooge or worse. It is no wonder, therefore, that companies that are serious about facing up to decline prefer to do so as private businesses rather than as public companies. While denial is understandable, it is also costly to investors. 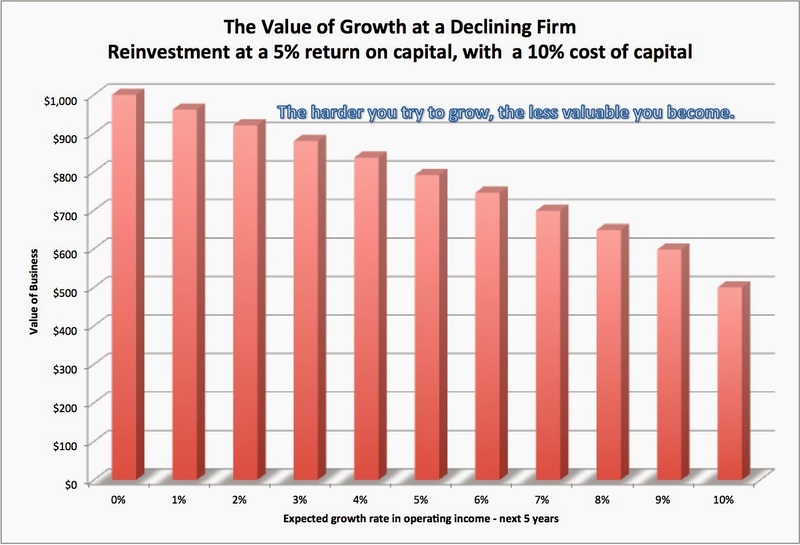 As I have noted in a prior post, growth can be value destructive, if it is expensive. 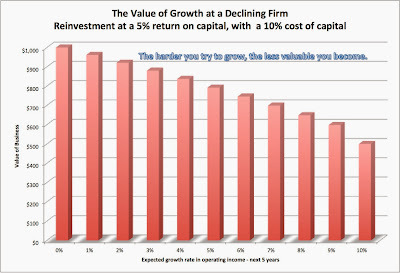 In fact, to illustrate the effects of “value destroying” growth, I have taken a base case of a mature company, with no growth prospects and $100 million in after-tax earnings that pays out its entire earnings as cash flows. If you attach a cost of capital of 10% for this company, its value is $ 1 billion (=$100 million/.10). Now assume that the managers of this company decide to push for growth, though that growth requires them to invest immense amounts of capital (in acquisitions, R&D and new projects) with a return on capital of 5%. 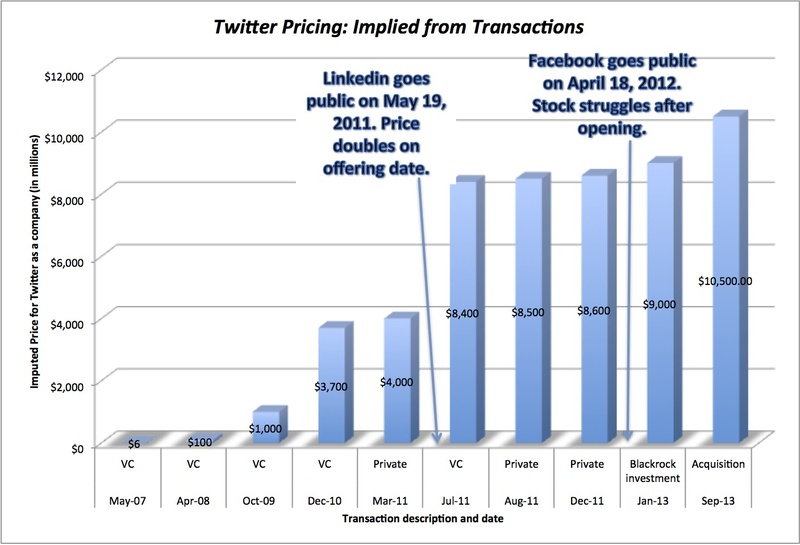 In the figure below, I have the value of the company at different growth rates. You can consider the difference between $1 billion and the estimated value of a company at any given growth rate to be the cost of denial to investors in the company. Thus, at a 5% expected growth rate, the value of the company is $792.47 million and the cost of denial by managers (and for stockholders) is $207.53 million. (You can play with the spreadsheet by clicking here). These are companies that I have seen tagged as cheap companies repeatedly over the last ten years, but none of them would have delivered much in terms of returns. These three companies had management teams that have tried hard to return them to growth status, spending billions of dollars in that venture: Merck in R&D, Cisco on acquisitions and Microsoft on “new” products. I know that I have the benefit of hindsight here, but I would wager that investors in these companies would have been better served, if they had lowered their sights on growth and focused on delivering the most earnings from existing investments and returning the cash back to stockholders. 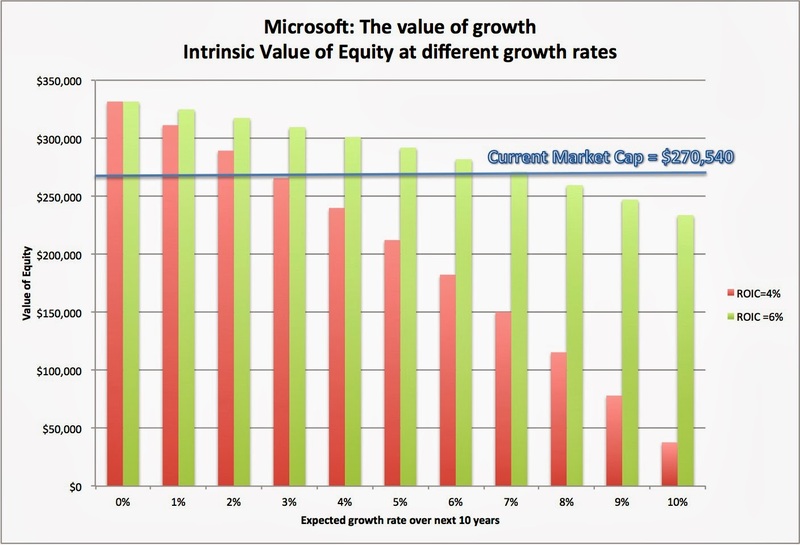 The intrinsic value of Microsoft drops with every increment in growth and at a growth rate of 7% for the next decade, the intrinsic value converges on the actual market price. This may explain the horrific reaction that the market had to Microsoft's announcement that it would acquire Nokia for $7.2 billion, and Microsoft's market capitalization dropped by more than $15 billion. It may not have been the acquisition per se that triggered the drop off but the signal that it sent to investors that Microsoft with its new CEO (from Nokia) would keep trying to grow. The best news, if you buy int this analysis and you are a Microsoft investor, would be an announcement by the firm that they are disbanding their R&D department, stopping all new product development and appointing Larry the Liquidator as their new CEO. Ultimately, no matter how hard you fight aging, reality sets in. For individuals fighting middle age, the moment of awakening may be a torn muscle from trying to run a fast break on a basketball court, but for businesses, it may take a longer time. In some cases, it may require pressure from activist investors and in some, a new top management who has no emotional connection to the company's history. In some, though, it will be forced upon the business by external factors, difficulty making a debt payment or an inability to retain employees. What form will acceptance take? If the business is mature, it will start behaving like a mature firm, tilting its capital structure towards more debt and increasing cash returned to investors. For many followers of Apple, that capitulation seemed to happen in their March earnings report, where the company ratcheted down its forecasted growth, announced its first debt issue and increased its stock buybacks. If the business is in decline, it may be the acceptance that the future will not only be less rosy than the past but also a plan for gradual or partial liquidation. That, to me, seems to be the message in the proposed Blackberry deal. Fairfax Financial is the largest stockholder in Blackberry and its chief executive, Prem Watsa, has been labeled the “Canadian Buffett”. His plans seem to be to focus on Blackberry’s business services and to throw in the towel on the smartphone and tablet businesses. Will he succeed? I hope so but I think he has his work cut out for him. The company has done significant damage to its orderly liquidation prospects in the two years since my last valuation and it may be too late to turn this ship around. On a personal note, I am older today than I was yesterday but given the alternative, I am okay with that. I really don't want to be eighteen, twenty three or twenty five again, not because those were not great years, but so was my most recent year. I could tell you that I know more today than I did three decades ago, but that is really not true, but I do know more about what I don't know today than I did three decades ago (if that makes any sense). Keeping with the theme of this post, I know that my Tesla/Facebook days are way in my past (I am not sure that I had them), that my Google days are in my rearview mirror, that I am probably in the Apple days of my existence (which is really not too bad) and that I will one day be in my Blackberry/Microsoft phase of life. I can only pray that when that phase arrives, I will have the grace to do an orderly winding down of my activities and not keep reaching back in time for the glory of bygone days. In the meantime, I will get my revenge on time by using it as productively as I can.